Squidoo has changed, as I noted in my lens on Squidoo’s Beginnings: A Look Back. Whereas educational, informational, creative and reader-centric content was once endorsed from the top down (as Seth Godin showed in his recap of Squidoo’s first five years), Squidoo now seems to have a narrower, more commercial focus. Compare the content categories recognized by the old Lens of the Year and Giant Squid awards competitons with the new SquidCademy quest, which is limited to lenses with an Amazon Spotlight module. In the past year, I’ve found that Squidoo demands ever more work and ever more lenses to maintain the same level of income. This is partly due to competition from the ever-increasing numbers of top performing lenses. Also, for some reason, the impact of updating a lens every week seems to hold more weight than it used to. When good lenses require constant maintenance to make a profit, and the profit is only a few dollars a month, the ROI is just not worth it: one spends too much time polishing existing work instead of creating new content. I’m also frustrated with HQ’s confused response to duplicate content and copyright and fair use — requiring credit and a link does nothing to resolve duplicate content or copyright issues. I’m dismayed by HQ’s refusal to address the copyright problems with the “Pin It” button, (see this lawyer’s discussion of Pinterest’s legal pitfalls). Therefore, I’ve stopped using Squidoo to post photo essays and original content like Ancient Greece Odyssey. Instead, I’m using Squidoo for more “lightweight” content: product reviews, gaming tips and help, and galleries of random fun things that get a lot of clickouts. Clickouts are what Squidoo rewards that other sites don’t, so I keep that in mind when deciding where to post what. Hubpages quickly responded to members’ concerns about Pinterest, offering a nopin code option for those who prefer it and a “Pin It” button for those who find Pinterest useful. Therefore, I’ve been posting essays and educational articles on Hubpages. It doesn’t pay as well, but payouts are commensurate with how my hub is performing, so it really is passive income: I can create a good article, and as long as it keeps attracting traffic, clicks, and sales, I’ll be paid directly for those things. I’m enjoying being able to write the kinds of articles I really love to write on Hubpages: cool science, quirky educational topics like The Meaning of Expecto Patronum, archaeology and fascinating stories, and photo essays. Hubpages’ clean, professional-looking interface is a better fit for that kind of content. I’m also enjoying the positive feedback from both the community and staff on the content I’m most proud of. My old pre-Squidoo stores still make a little income. I’ve also got some Cafepress affiliate links embedded on some of my game lenses. It’s not much income, but every bit helps. Now that I know more than I did when I started these stores years ago, it’s time for me to spruce up my products, add more, and promote them better. Except I enjoy and spend most of my efforts on writing, nowadays! I haven’t spent enough time on my Zazzle stores to make consistent income. Ditto Allposters. Both of these yield less than $100/year. But again, they’re building up bit by bit. Adsense on my blogs is yielding just a few dollars a month. I briefly tried adding Project Wonderful ads instead, since they have more relevant ads for education and writing blogs, but I haven’t spent the time I should to figure out what works best with that Adsense-alternative program. I need to move some of my Tolkien-centric articles back off Squidoo to my old Tolkien website and upgrade it before the next Hobbit movies come out. That should help with Adsense, Amazon Associates links. I’ve joined Commission Junction, but was disappointed to find that I couldn’t sell iPad apps (I wanted to review my favorites). I haven’t spent the time to investigate what other CJ products might suit my niches. I am still not really a marketer at heart; I’d rather be creating excellent content. I ponder chucking all of this and working on an eBook, but then I’d be earning nothing while I devote my energies to that. And, frankly, I’m enjoying the challenge of learning what works and doesn’t on the ever-evolving web. SEO, semantic search, the social web— these are topics that I find myself constantly chewing on and studying, through the vehicle of all my different kinds of web content. Most of all, I enjoy the challenge and luxury of being able to exploit and make use of all my interests, knowledge and passions, instead of having to limit myself to one thing. Very helpful and thank you. I am trying to do the same thing, but had not considered going back to hubpages. I do enjoy webnuggetz and I am building my presence there. We all need to spread our wings! I’m not sure if going back to Hubpages is the best idea; they may still be suffering a little from the Panda effect. If you’re doing well on another article publishing site, congrats! it’s not where you write but ROI that matters! And, perhaps, what kind of content each site is geared towards and favors. I know what you mean about not enough time! Ellen, have you considered writing for the Kindle? 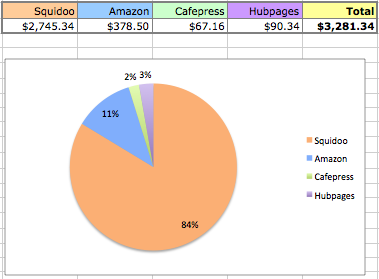 It’s taken me about 9 months to get to where I was on Squidoo after 4 years, income-wise. Full-length books are not required: shorter booklets sell well at low price points. Formatting and uploading takes a while the first time, while you learn the wrinkles, then it’s easy. Moving some of your content there might be a good choice. Kevin: I’ve definitely thought about the Kindle. In fact my mythology blog is syndicated on the Kindle! Diversification has helped me greatly in improving my online earnings. When Hubpages took that hit last year, it wasn’t fun, but since I had Zazzle, Cafepress, Squidoo, and my own blogs, it wasn’t quite as bad. I do have to say this about Zazzle and Cafepress: the time I invested there was well spent. I spend zero time promoting my products, and they still bring in hundreds of dollars (thousands during the holidays) per month. I did a lot of heavy promotion using Squidoo in the past for my Cafepress and Zazzle products, which still brings in some sales. With the election heating up, I have to make an effort to spending more time on those sites once again (2008 had ridiculous sales levels). My one tip for Zazzle/CP would be to diversify there as well, in terms of types of designs. Cater to everyone, and you will make money. And, I know what you mean about the ebook vs. instant gratification of online publishing thing. I wrote an entire 55 page ebook and published it all for free (ebay help tutorials) because I couldn’t wait for the content to be read. It was a fun process though. I really appreciate this post, Ellen. I finally understood the difference between earning money on squidoo and on wizzley and I came back to focusing more on squidoo. I like wizzley, but I think it will take me longer to start earning money there. I’ve been here just long enough to start seeing patterns. Right now my Juba lens is doing really well but it may be a flash-in-the-pan since it is basically a photo essay and you say these don’t do very well on squidoo. What this post does for me is showing me that there definitely is a systematic way one can understand how to monetize articles in the various platforms available. Actually, photo essays can do very well on , especially if you have the full-sized photos hosted offsite, and display only thumbnails on the lens which click to open the full-sized versions. That produces clickouts, which can boost lensrank. My Funny Signs lens thrives on that. Even if the images are directly uploaded on your squidoo lens, with Squidoo headers, body text, and the “label” field on images uploaded into text modules, you can zero in on a topic and get a lot of image search traffic. So your photo essays CAN work on Squidoo, as long as you’ve done some keyword research. (tip: do some Google image searches and see what related search terms come up. These may be good phrases to use. The problem with photo essays on Squidoo is that the “pin it” button lets people upload copies of the images on the lens to Pinterest. In theory, that should get traffic from Pinterest, but often, Pinterest members view the images on Pinterest and never visit the lens. Repins often break the links to the source site, and Pinterest provides embed codes so that pinned images may be displayed on any site on the web, like embedded Youtube files, except that the embedded codes point back to Pinterest’s copy of the photo, not the original. All of which means I’m now posting photo essays on Hubpages, where they earn LESS money, because Hubpages lets us choose a “nopin” option in our profile settings that gives Pinterest members a copyright warning and blocks them if they try to pin a graphic from my hubs. I wish I could set it on a hub-by-hub basis, as there’s some of my own photos I wouldn’t mind having pinned, but for the most part I prefer to maintain copyright of my work. You aren’t doing so badly though, earning 10 times more on Squidoo than I am, but then most of my lenses get virtually no sales, and the competition for the top 2 tiers is ridiculous these days. There is a lot of potential for income with Zazzle, also art sites like Fine Art America, Red Bubble and Imagekind. It might be worthwhile spending a couple of weeks and dedicating them to creating several niches on Zazzle. If you promoted them with lenses, blog posts, and also tagged them well so that other people hit on them and promoted them, the sales there might increase nicely as well. I think Wizzley and Zujava are coming along nicely, but I have done almost nothing on either of them so far due to lack of time. Definitely worth dedicating a week each to I think, just to see what happens. Wishing you luck. I just wish I had the time to develop my web sites more, as well as to publish more lenses as well. Just not enough hours in the day. Not enough hours, for certain! I feel bad for you though, Tony. It IS hard to make a living online, but it shouldn’t be that hard to get at least some tier twos and more sales than you’re getting. I’m working on a new tutorial about sales, since I do actually make some sales every day (although nothing like some people do). But in the meantime, have you seen my lens on how to get more clicks, sales? At least some ideas there might be useful.